203 in stock Need More ? This has all the ingredients of Me Before You' Cosmopolitan 'Funny and winning... a Richard Curtis rom-com that also has its feet firmly planted in real life. A real treat' Stylist'The last book to completely emotionally absorb me in this way was Eleanor Oliphant Is Completely Fine, and I think fans of that will adore this'Daisy Buchanan**********Tiffy and Leon share a flatTiffy and Leon share a bedTiffy and Leon have never met... Tiffy Moore needs a cheap flat, and fast. Leon Twomey works nights and needs cash. 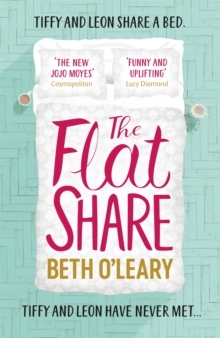 Their friends think they're crazy, but it's the perfect solution: Leon occupies the one-bed flat while Tiffy's at work in the day, and she has the run of the place the rest of the time. Fans of Jojo Moyes's Me Before You will love this UpLit romcom' Red Magazine'In the league of Bridget Jones and Marian Keyes' Walsh sister books' Claire Allan'Funny, emotional and uplifting' Sun'A quirky, feelgood read, bursting with character and warmth' Prima'The Flatshare is a huge, heartwarming triumph'Josie Silver'Uproariously funny with characters you fall for from the first page' Woman & Home 'Deliciously funny and truly uplifting'Lucy Diamond'Touching, funny and skilful, a delightful read'Katie Fforde'It's funny and charming but there are moments of real poignancy, too.